A look at a new league this weekend on the Supporting Women’s Football Blog covered on Women’s Football East, the Cambridgeshire Women’s Championship South a trip to the GER Sportsground to watch unbeaten league leaders march Town United Ladies play a local derby match against 3rd placed and in form Wisbech Town Ladies. The Supporting Women’s Football Blog has covered plenty of teams a different leagues across the country in the past 3 and half years, today it was time to take a look at a new league not covered before which is surprising with it being so close to home, the Cambridgeshire Women’s Championship North to watch the league leaders unbeaten March Town United Ladies take on 3rd place and in form Wisbech Town Ladies. March Town United Ladies are into their 4th season as a team have played in both the North and the South Leagues did see them play a long time ago getting on for 3 seasons now when they were in the South League away to Cambridge Rangers back in the early days of the SWF Blog when I didn’t cover a match as extensively as I do now. Have grown as a side. 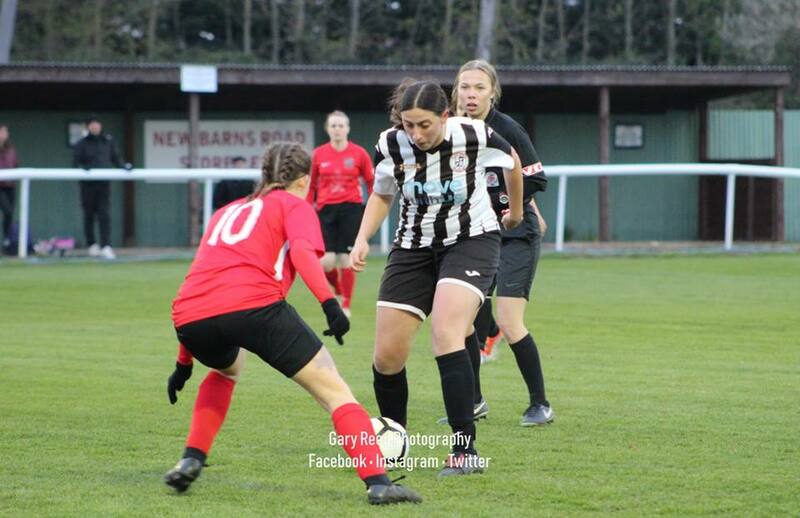 Finishing 2nd in the Championship North last season are going strong this season leading the table for most of the season 7 straight wins at in the league before they were held to a 1-1 at home to Wisbech St Mary Ladies last weekend. Lead the Championship table by 4 points. Another local derby match today at home as they host Wisbech Town Ladies. 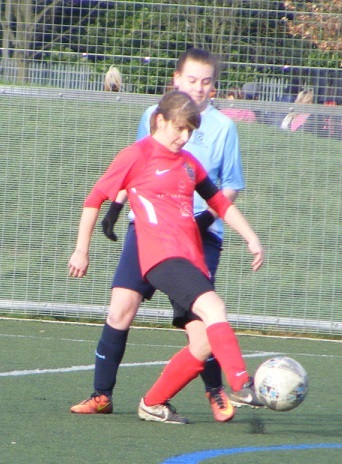 Wisbech Town Ladies come into today’s match in great form having won 4 successive games in league and cup. 9 points from that ru taking them all the way up from 7th into 3rd. Have also reached the semi-finals of the Cambridgeshire Women’s Junior Invitiation Cup for the 2nd successive season having reached the final last time around. Today they travel with just the bare 11 however having several players unavailable fo various reasons. The venue for today’s game the GER Sportsground, home of March Town FC known as The Hares. An old ground that boasts the 2nd oldest wooden stand in the country. Painted blue the main stand is set a little back from the pitch however this is because the ground also hosted cricket cycling and greyhound racing up until 1960. The ground has a new clubhouse that houses a bar and kitchen along with the changing rooms. Tea and coffee also available. The pitch itself is a good size pretty firm the clocks went forwards this weekend everyone lost an hour in bed but at last it looked like spring was here bright and sunny nice to see able to take the coat off for the 1st time this year. 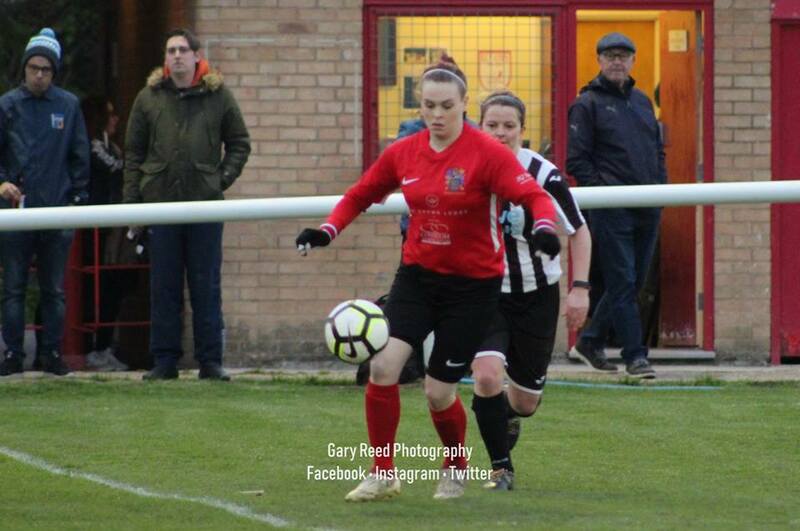 Wisbech Town Ladies starting XI – Abbi Venni, Amy Hepting, Chloe Minall, Kaylie Swinden, Emily Stephenson (C), Polly Norman, Rachael Simpson, Shushannah Feast, Annie Rooks, Zoe Tyhurst & Sophie Gutteridge. A switch of ends before kick-off Wisbech opting to have the sun a their backs 1st half. It’s March to get the game underway wearing yellow shirts with a black band across the top and shoulders, black shorts and socks. Wisbech lined up opposite wearing red shirts and socks with black shorts. The visitors press the ball early keeping March pinned back in their own half striker Sophie Gutteridge, Wisbech’s top scorer so far this season with 20 goals closing down the defence getting her side a throw on the right the ball is crossed along the face of the area, with Gutteridge running onto it left of the D gets a shot away but never in control of the ball it rolls wide of the far post. A good start from Wisbech, won’t let March get out of their half winning a throw in on the left the ball is given to Annie Rooks good hold up play before twisting away from her marker playing the ball in across the face of the area with Shushannah Feast in a central position the bounce of the ball doesn’t favour a left foot volley adjusting to strike with her right foot the shot is pulled wide of the far post. A good tackle from March’s Emma Searle at the back to thwart Wisbech’s Gutteridge as she threatens to run clear through the middle, the ball out for a throw taken quickly March counter the ball into captain Jade Pointer into midfield plays it on over halfway into space left side with Emma Frost beating the offside trap and running clear heads for the Wisbech box 25 yards out with Stephenson closing the ground lets fly with a shot a swerving ball, goalkeeper Abbie Venni, celebrating her 18th birthday in the week, having initially started to go one way adjusts her body well to stop the ball slipping past her deflects it away for the corner kick. Played in from the left side whipped in with vicious pace the corner kick flies over Venni is heading straight into the net is blocked on the line by Wisbech midfielder Rachael Simpson chesting the ball down before clearing, March go up claiming it had crossed the line the appeals are waved away play goes on, I’m on the halfway line got a picture but no goal line technology in this league. Both sides are using the width of the pitch, Hodges with space to run into on the right is closed down by Minall can’t squeeze her cross into the area, up the other end Feast with a surging run on the left with the ball fires a vicious cross into the box looking for Rooks running in, Searle gets their 1st slices her clearance high into the air. A good contest developing in the middle of the pitch plenty of energy from both sides. GOAL! The deadlock is broken midway through the 1st half Wisbech are awarded a free kick inside the March half left side a good way from goal close to 40 yards Stephenson goes across to take it as players go forwards line up across the top of the March area. Is a sweet strike by Stephenson as soon as it is flight you can tell it’s a great ball plenty of pace the ball flies towards goal a difficult one for keeper Tori Sharpe with runners closing on her the ball flies over her dipping late under the bar to make it 0-1. 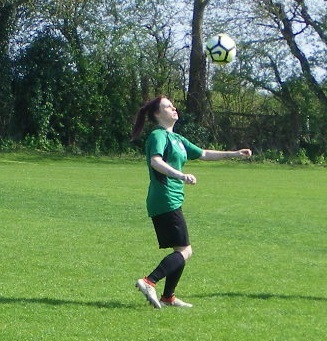 The ball is closed down inside the Wisbech half pinging around between feet eventually falls to March’s Shannon Kelly 35 yards out connects with the ball on the half volley sending a looping shot in towards goal Venni has time to set herself catch the ball inside her six yard box. March make a change Ella Nutter recently signed from St Ives Rangers Ladies coming on for Frost up front. Simpson has gotten forwards for Wisbech the ball is played into her at the top of the area back to goal she rolls it into Zoe Tyhurst moving central looks to bring the ball under control shift it inside to shot is closed down by March’s Claire Newton the chance gone. Hodges is played through on goal by Nutter as March break with purpose taking the ball right clear of the Wisbech defence Hodges pulls the trigger from 20 yards blasts her shot wide of goal. Nutter getting forwards herself on the left is brought down by Wisbech’s Amy Hepting. Searle over the free-kick looks to play the ball in towards the near post runners breaking from the top of the box Venni is distracted sees the ball safely into her gloves. Venni is quickly out of her box soon after to clear the danger as a favourable deflection at the beck sees Nutter race in behind the Wisbech defence can’t reach the ball before the goalkeeper does. March make a 2nd change with Churchyard coming off at left back for Paige Bedwell-Mann a former Wisbech Town player. Brown with a powerful midfield run takes the ball on for March rolling it into the path of Hodges ahead of her, Minall gets on her shoulder prevents the striker getting a shot away as they enter the box marshalling the ball into Venni’s gloves as she comes sliding in to gather. The Wisbech defence giving very little away at the back, Brown finding room to get forwards for March lays the pass out to Nutter drifting into space wide left, Hepting gets back on her to close her down, Nutter keeps possession shifts the ball half a yard room to play the ball int Kelly breaking into a central position, Kaylie Swinden gets across her sees the ball back into her keeper. A 1st half injury time corner for March taken on the right the ball played in towards the top of the area, is won by Wisbech the counter attack on the ball launched up field for Gutteridge to go after, Bedwell-Mann is the last defender has to win the ball and does very well under pressure to nullify the danger. March with one last attack in the 1st half the ball rolled into Nutter looks to send Hodges through on goal, again it’s Stephenson who gets across to win the ball before the attacker can get in a one on one situation with the goalkeeper. A 1-0 lead for Wisbech at half-time in a hotly contested derby without the niggle and arguing off the ball. Played at a good tempo few clear cut chances a great delivery from a set-piece the difference between the sides. Wisbech with a good 1st half have done well to limit the threat from march’s attacks their defenders quickly moving in to close down the threat haven’t let very little get in behind. March’s defence too to their credit have prevented Wisbech getting into too many shooting positions albeit defending a deeper line restricting the space in wide areas. An intriguing 1st half a narrow lead all to play for 2nd half. Bringing the ball forwards on the left Bedwell-Mann fizzes a ball in towards goal from 25 yards out straight at Venni the ball momentarily pops out of the goalkeepers gloves, she reacts quickly to pull the ball into her body as Hodges coming in throws a leg at the ball. The game continues to be end to end both sides attacking, Tyhurst away into the left channel, sends a long cross into the area, is dealt with by Bedwell-Mann, counter attacking the ball played into Pointer is helped forwards Hodges gives chase can’t reach it before Stephenson can come across and clear the ball for a throw. Rooks bringing the ball on through the middle sends the ball into Gutteridge’s feet inside the D back to goal turns and shoots marked closely the ball is blocked, comes back to Gutteridge on her left gets a 2nd shot away this one off target rolls wide of the post. Pointer is back on the field for March as Wisbech successfully defend a corner kick. 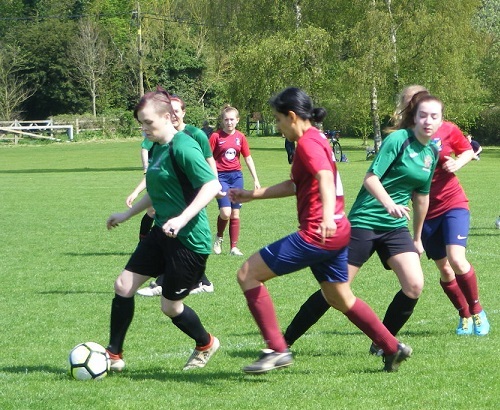 Munday brings the ball on through the middle of the park for March looks to send Hodges through in behind, Venni reacts quickly on the move early slides into claim the ball at the top of her area before Hodges can take it round her. GOAL! A little over 10 minutes left on the clock and March get themselves back on level terms pushing players on in search of the equaliser it’d Brown breaking from midfield who latches onto a lay off on the left side space before lets fly from the top of the area the ball flies over Venni smashes down off the crossbar into the six yard box, Brown following up reaches it 1st stabbing the ball past the keeper who throws her leg at the ball but doesn’t reach it as it nestles in the back of the net 1-1. 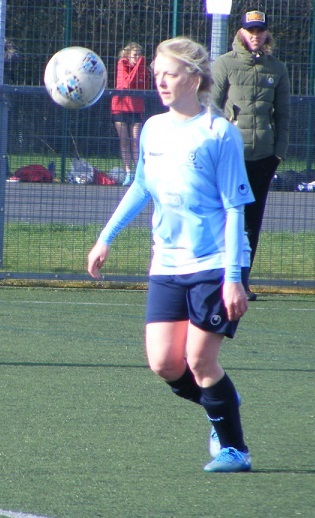 Laura Coe comes off the bench for March to replace Bedwell-Byatt as the game moves into the last 10 minutes. 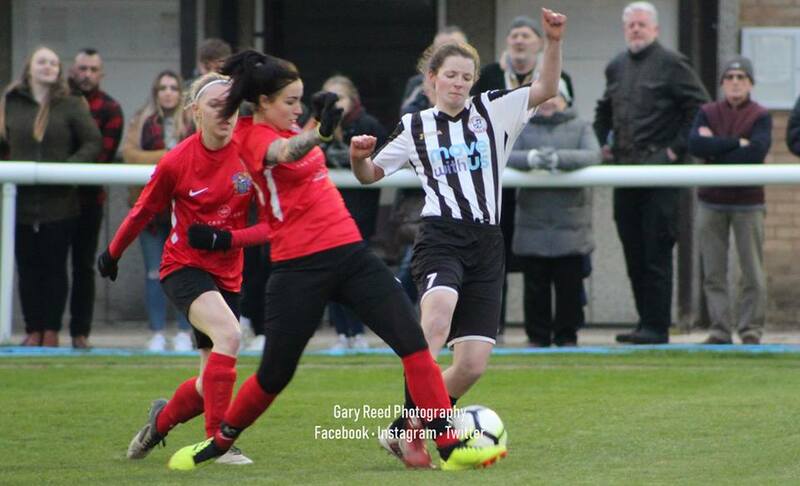 Munday strong on the ball through the middle sends the pass on for Coe ahead of her the 16 year old playing her 1st season of women’s football heads for the box, Swinden coming across forces her left into Hepting who tackles and wins the ball. March able to rotate their subs are seeing more of the ball in the latter stages of the match, still it’s the Wisbech defence quickest to the final ball as they have been all game. Pointer is down struggling with an injury in the middle for March. Stephenson takes the opportunity to rally her side. Pointer can’t continue and his helped off the pitch. 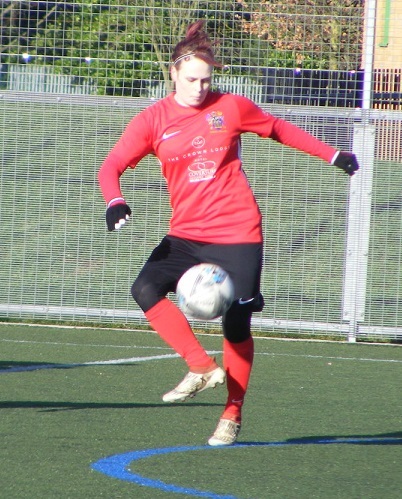 Today’s SWF Blog – Player of the Match goes to Wisbech Town Ladies captain, Emily Stephenson. 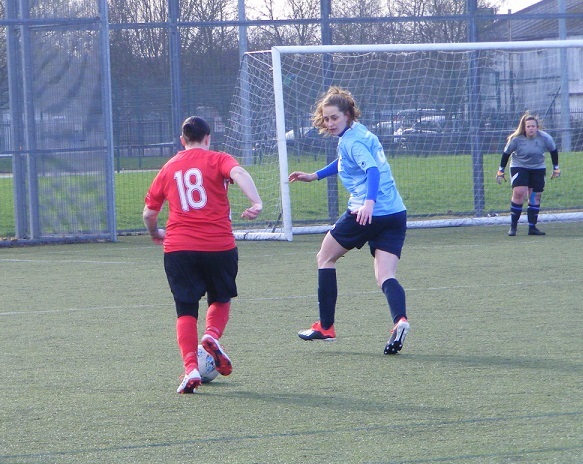 With a excellent free-kick to open the scoring, nothing was getting past her at the back today a solid defensive display from the whole defence. 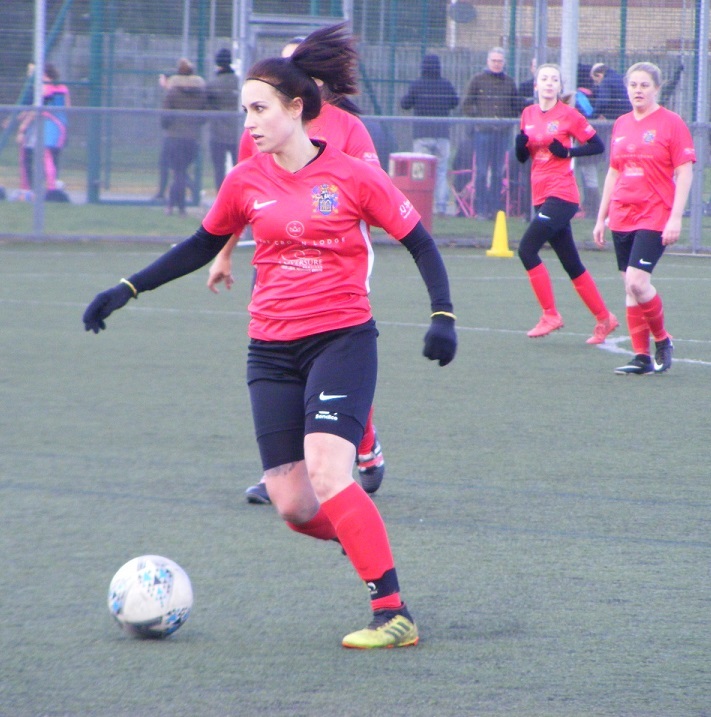 This entry was posted in Cambridgeshire Women's Championship North, Match Reports, SWF Blog and tagged Cambridgeshire Women's Championship North, March Town United Ladies, Match Report, Wisbech Town Ladies on March 27, 2017 by WFEast. 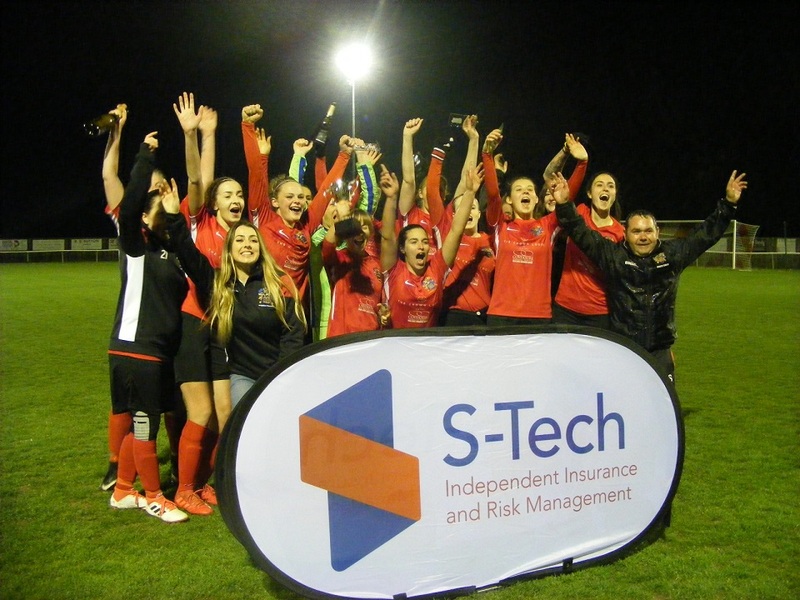 A midweek trip into Cambridgeshire to watch the final of the Women’s Junior Invitation Cup sponsored by S-Tech Insurance, with defending cup holders Cambridge United WFC Reserves taking on Wisbech Town Ladies for the trophy. 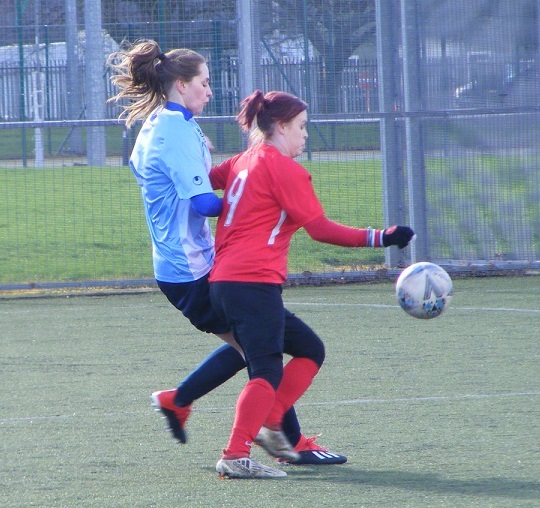 Cambridge United WFC Reserves are currently top of the Cambridgeshire Women’s Premiership. Beat Milton Ladies from the Cambridgeshire Women’s Championship South in last years final 4-0. 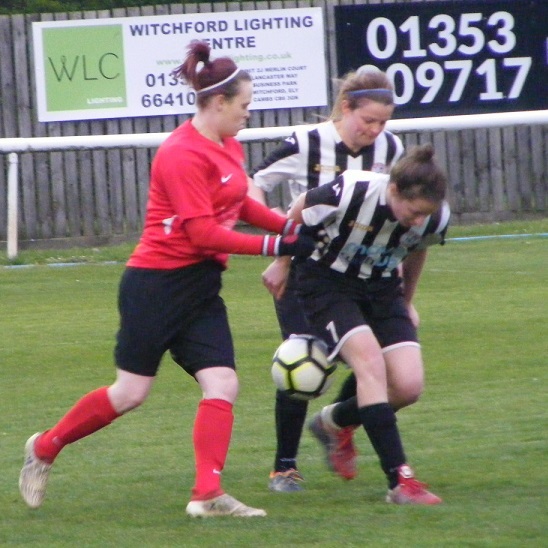 Defend the cup once again against lower league opposition from the Championship North this time around, Wisbech Town Ladies, have dropped to 5th in the table after the weekends results despite holding the current league leaders Bourne Ladies to share the points in a 2-2 draw. 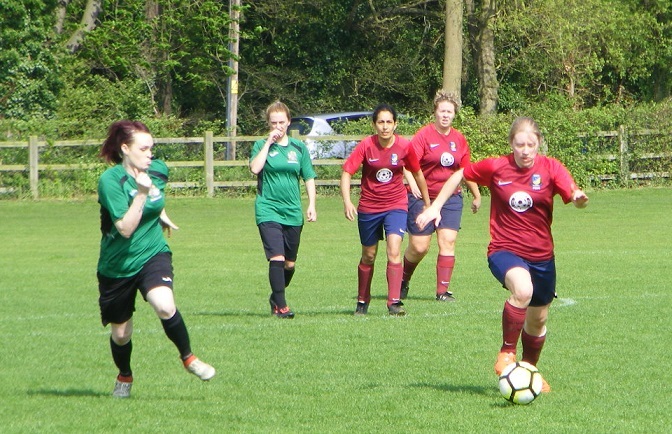 It was an away tie to start the defence of the trophy for Cambridge United WFC Reserves taking on Championship North side Wisbech St Marys Ladies a comfortable 4-0 win saw them through the quarter finals. 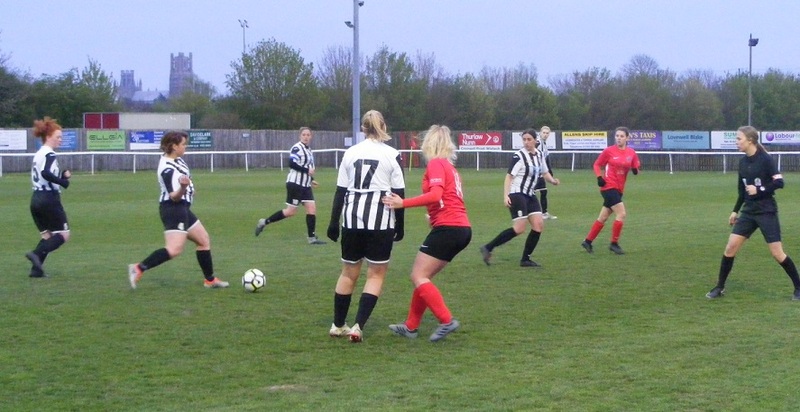 Drawn away from home they met Milton Ladies in a repeat of last seasons final scored 4 goals again to win the game 4-2. 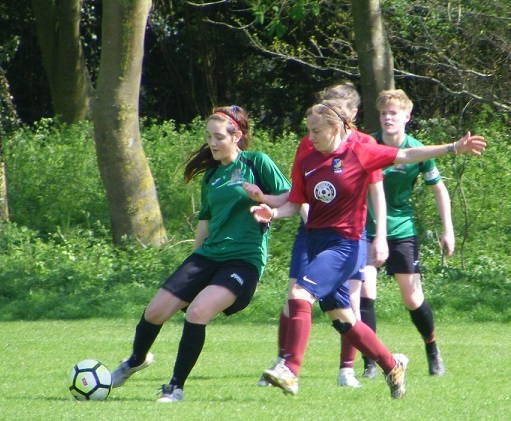 Drawn at home to Isleham United Ladies in the semi-finals they were awarded a home win with their opponents unable to field a side to book their spot in the Women’s Junior Invitation Cup for the 2nd season running. The opposite for Wisbech Town Ladies they started the competition by being awarded a home win in the 1st round against Comberton Ladies. 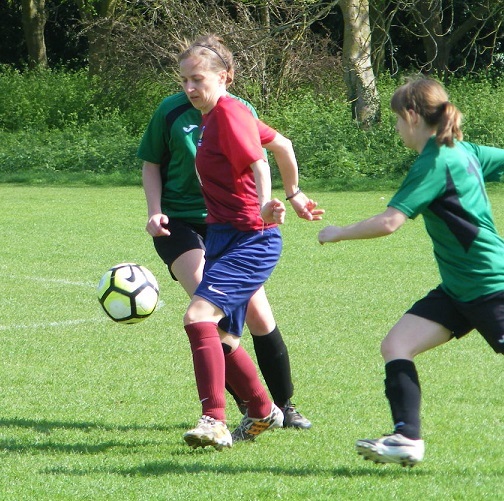 In the quarter finals faced a tough away draw against Premiership side Fulbourn Bluebirds. the game ending all square at 2-2 after extra-time the game went to a penalty shootout Wisbech Town Ladies winning 2-0 to progress to the semi-finals. 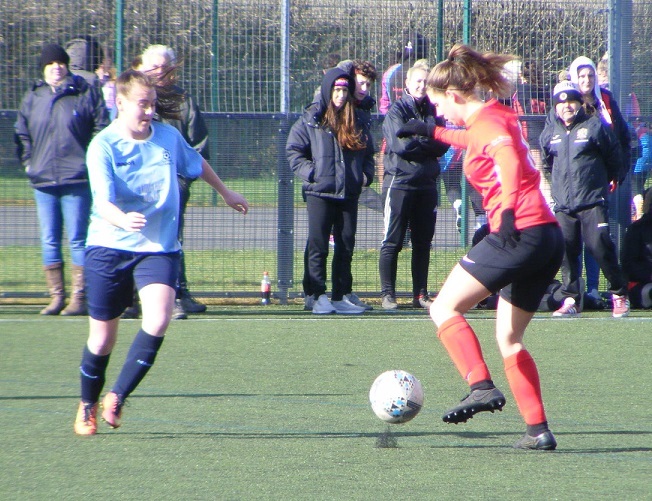 Were drawn away from home to face Park Ladies from the Championship South, an interesting match up Wisbech Town Ladies proved too strong on the day taking the tie with a 3-0 victory to set up a final showdown with Cambridge United WFC Reserves. The venue for tonight’s final Ely City FC, the regular home venue for Cambridge United WFC’s 1st team. 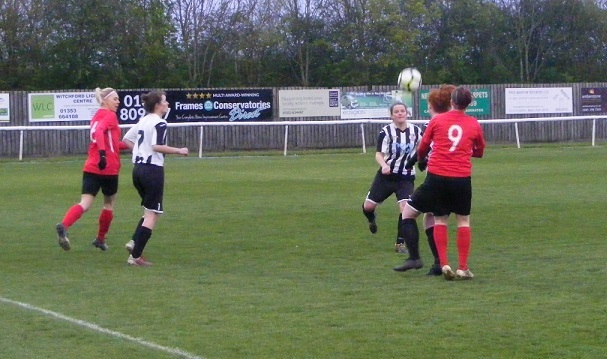 Tonight it hosted their Reserve side and Wisbech Town Ladies who had brought a good number of supporters with them. The pitch which has seen alot of football was a little worn in places but overall showed good grass coverage. A large pitch surrounded by a railing a clubhouse with built in seated stand on one side opposite the dugouts. A cool but dry evening, good weather conditions for a Cup Final. Cambridge United WFC Reserves starting XI – Tafadzwa Mhunduru, Emma Roberts, Becca Fay (C), Robyn Phillips, Liz Pamplin, Emily Ingle, Sarah Mosley, Emily Reed, Hayley Turner, Kelly Docrwa & Monique Christian. 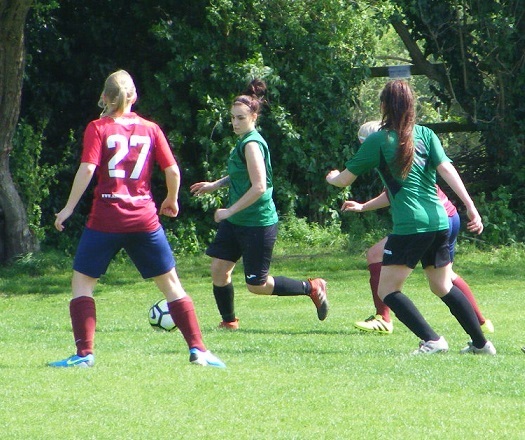 subs – Catherine Hanley, Gemma Clark, Sarah Carroll, Kirsten Burt & Ebony-Jade Rule. 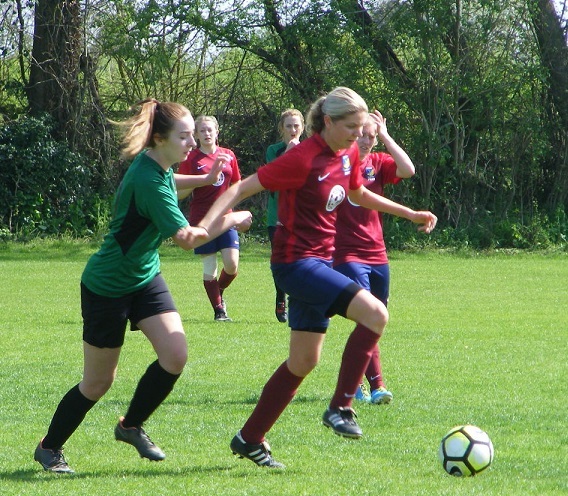 Wisbech Town Ladies starting XI – Abbie Venni, Danika Moss Papke, Emily Stephenson (C), Elizabeth Simpson, Faye Kowalewsky, Annie Rooks, Kyra Clarke, Polly Baird, Chelsea King, Albany Hodgson & Sophie Gutteridge. The floodlights start to come on as Wisbech wearing red shirts with black running along the sleeves, black shorts and red socks get the 1st half underway with Cambridge lined up opposite wearing amber and black vertical striped shirts, black shorts and amber socks. The ball is sent long down the right flan early on the attempted cross charged down turned out for a throw. A relatively quiet open to the match as both sides look to test the other out putting the ball into their attacking players without anyone finding any joy finding space behind. 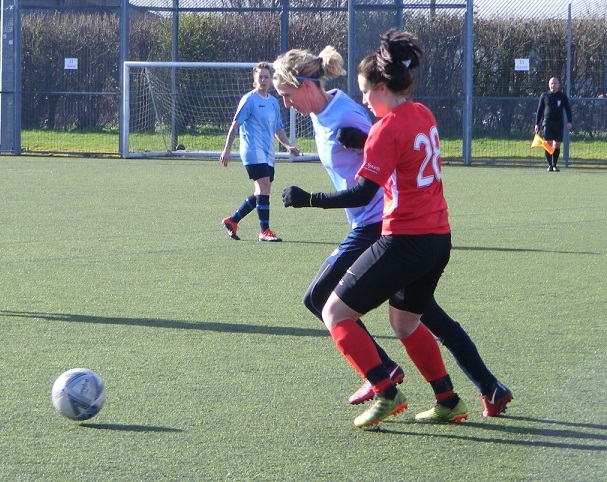 From a throw on the right inside Wisbech’s half, Cambridge central midfielder Liz Pamplin longs to play a pass dissecting the centre backs with Hayley Turner looking to make a run in behind right of goal chasing the ball can’t catch it be the ball runs out of play. Making progress into Cambridge territory winning a series of throws down the left the ball eventually comes to the feet of Wisbech’s Polly Baird who passes the ball down to Sophie Gutteridge moving into the left channel, looks to try and drive inside pick out Kyra Clarke pushing to get into the Cambridge area, Sophie Ingle tracks back for Cambridge and closing Gutteridge down wins the ball back on the edge of the area. Passing forwards into Sarah Mosley who plays a great ball up the right side for Turner to go after she wins Cambridge the 1st corner of the match the ball is sent in low and fast to the back of the area, met on the volley by Monique Christian the shot is sent over the crossbar. Both sides are playing it long from the back their attackers trying to win the ball in the air, Clarke goes up for the ball inside the Cambridge half under challenge for the ball bashes her head against her opponent and goes down. A lengthy pause as she receives treatment a nasty blow to the head unfortunately her cup final is over as the stretcher is brought on and she is taken off. No chances taken with concussion, an ambulance is called and after being seen to by the crew is taken to hospital for further checks, wish her a full and timely recovery. Play goes on Jemma Adams coming on to replace Clarke. Mosley takes a free kick won on the right inside the Wisbech half puts it long towards the area with Turner making the run to get onto the end of it inside the box, Wisbech central defender Elizabeth Simpson stays with Turner and keeps her from connecting with the ball as goalkeeper Abbie Venni comes to scoop the ball up into her gloves. 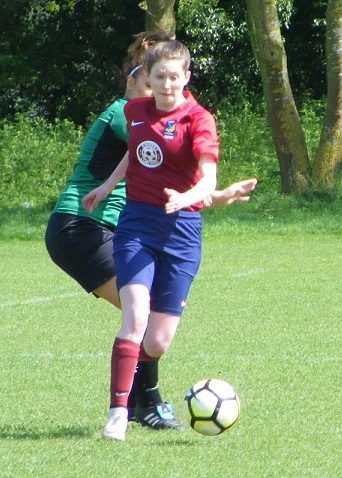 Gutteridge is the focal point of the Wisbech attack and is busy working across the Cambridge back line probing for an opening as the midfielders try to play the ball into her feet. Closing down the ball in the middle, Mosley coming to the right side sends Kelly Docrwa away down the wing, has Ingle up in support coming inside into the box the ball is played into her headers it down, Venni reacts going to her left and pushing the ball behind for a corner kick.Cambridge keep the pressure on from the corner kick as Wisbech struggle to clear it pops back to Emily Reed left outside the area fires the shot back in again Venni saves throwing herself to her right to put the ball behind for another corner kick. 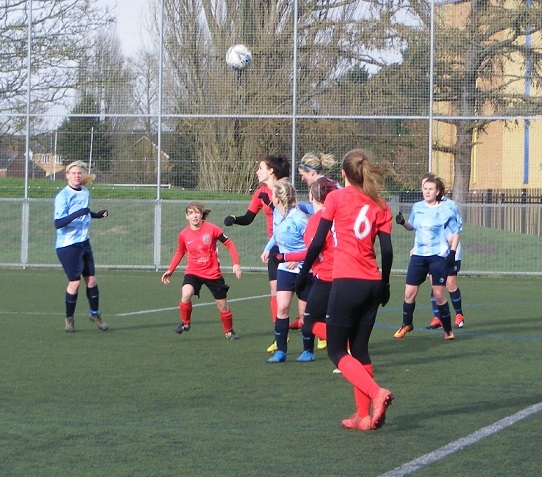 A firm header inside the six yard box sees Wisbech clear the ball set up a counter attack with Annie Rooks bringing the ball on forwards into Gutteridge who peels left again, isn’t getting much joy against Cambridge’s Robyn Phillips as she tackles to win the ball. 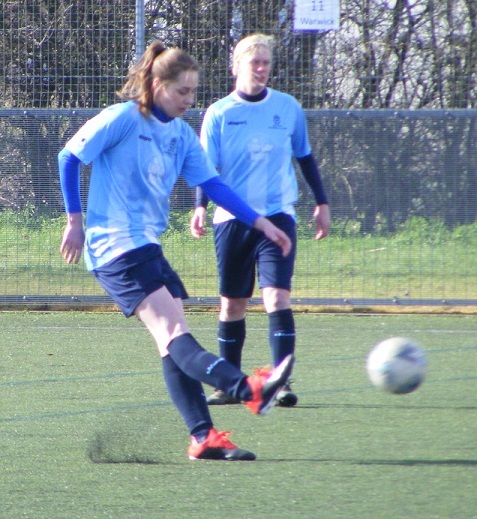 A free kick inside the Cambridge half 30 yards out for Wisbech sees Albany Hodgson on the ball, a good delivery sent into the area, Cambridge’s Emma Roberts puts her name on the ball and headers it away. Wisbech retrieve the ball and attack down the right whip a cross into the area, Cambridge goalkeeper, Tafadzwa Mhunduru moving to that side of her area brings the ball down into her gloves. Up the other end Venni is called into action again Reed putting Christian through on the left side pulls the trigger from 20 plus yards, the shot coming in low is turned around the post as Venni throws herself to her right. GOAL! Cambridge take the lead from the resulting corner kick, although not many in the crowd initially release they have down so thinking the ball coming in low with plenty of pace from the corner taker Ingle has run behind the goal, but no it is in running through the players gathering at the near post and rolling over the line to nestle in the back of the net Cambridge lead 1-0. Wisbech make a change bringing on Jasmine Luckett, combines with Faye Kowalewsky straight away the two working the ball into Gutteridge, tries to take the player on in front of her turn towards goal, too much to do, riding one challenge is stopped by the 2nd. GOAL! Cambridge’s lead lasts just 5 minutes as Wisbech pull it back all square just past the half hour mark, winning a free kick on halfway in a central position, Hodgson is over the ball looks to play it long into the area, Mhunduru comes towards the ball a it lands just inside the area, totally misreads the bounce as the ball skips up high over her falling behind to the left Wisbech have runners following in, Gutteridge is closest to the ball gets it, controlling inside her six yard box taps the ball home to make it 1-1. Is a scrappy contest with neither side really able to get their foot on the ball and keep any meaningful possession, Gutteridge is working hard in front of the Cambridge defence, Rooks trying to get up to support, whilst at the other end Cambridge are getting Docrwa, Christian and Turner in behind just not finding the right ball. 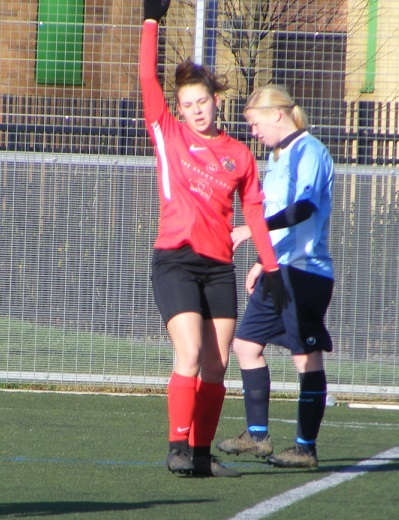 Amy Hempting is introduced to the action by Wisbech with Elizabeth Simpson coming off. Winning a corner on the left Cambridge try to take it quickly catch Wisbech before they can set themselves, Danika Moss Papke is alert to it and the only play from both sides already set inside the six yard box as the ball comes in headers it clear, Pamplin steals in to pass to Roberts who shoot from outside the box rolls through to Venni. Kowalewsky turns her marker to bring the ball on over halfway down the left for Gutteridge back to the goal, tries to turn Phillips the defender is a tall player to get around stick out a leg and comes away with the ball. Cambridge break the ball put up the right into Docrwa drives into the Wisbech box, squeezes a cross along the six yard box to the far side of goal with Christian standing unopposed, looks to scoop the ball up and around Venni the goalkeeper parries the ball down falling right Docrwa tries to get to it but under challenge from Wisbech’s captain Emily Stephenson can only slice her shot wide. 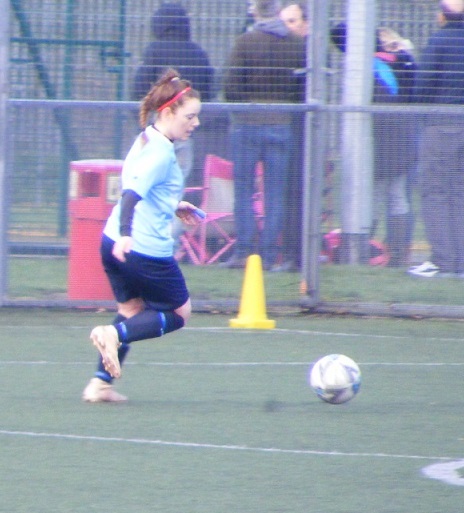 Leah Hall joins the action for Wisbech. Luckett and Kowalewsky link up again in the middle played onto Hodgson, tries to bring the ball on is floored by a robust challenge in the middle. The ball is played up to the area again, Cambridge captain Becca Fay winning the header on the edge of the box. Cambridge make a couple of changes late in the 1st half on comes Gemma Clark and Ebony-Jade Rule for Christian and Mosley. Fair to say this hasn’t been the most exciting 1st half of a Cup Final, has been scrappy but highly competitive both sides aren’t letting the other sit on the ball, are not picking out the right balls when they win the ball back the goals given away softly. Two sides that know little about each other have spent much of the 1st half trying to suss each other out. Gutteridge has done well on her own in attack losing Clarke to concussion early on was a blow. Cambridge get the 2nd half underway and start brightly get a free kick in the middle as Hodgson fouls Turner. Towards the right the ball is sent long out to the far post across the Wisbech area, Clark operating wide left is coming in but can’t connect to turn the ball in as it bounces wide out of play. Clark is played in down the left wing pushing on in behind with the ball cuts back on herself and rolls the ball along the face of the area into Ingle, closely marked she tries to wriggle free to get room for a shot ends up on the ground but no one claims for a penalty as Wisbech bring it away. Pamplin winning the ball inside the Wisbech half sees them continue to hold onto the ball early on Clark is put away down the left again, sends a pacey cross into Rule who meeting it on the volley cuts the ball high into the air and wide of goal. Reed with a good run through the middle plays the ball wide into Ingle her cross is turned behind for a corner kick, the ball is cleared out of the box back to the right sent back in Venni gathers this time. Good tackle from Stephenson on Rule as she gets the ball running into the area from the right. Wisbech have ridden out a testing 10 minute spell at the start of the 2nd half from Cambridge now getting more of the ball inside their opponents half, Kowalewsky bringing it right has Hodgson available, from the wide position she sends a high ball up towards the Cambridge area a tricky ball, Roberts sees it cleared with Gutteridge lurking. A surging run up the left wing from full back Moss Papke sees Wisbech earn a corner kick. The set piece comes to nothing, Wisbech don’t let Cambridge bring it far winning the ball attempt to put Gutteridge in behind, Mhunduru comes racing out to get her gloves firmly on the ball 1st. Regaining momentum Wisbech have Baird on the ball wide right like Hodgson minutes before she looks to send a high ball into the box higher up the pitch this one is dropping into the six yard box Mhunduru must see Gutteridge coming in the corner of her eye but isn’t distracted sees the ball safely into her gloves even as the striker leaps across her. Cambridge bring on Sarah Carroll and Kirsten Burt. Cambridge spring the offside trap turning play around quickly as it is won, at the back, both Rule and Docrwa turn and as the ball goes over the Wisbech defence are through on goal. Rule has the ball reaching the edge of the area hits the shot, put it too close to Venni, who needs to get down sharply with spin on the ball saves the ball deflecting out of play for a corner across the goal. The corner comes in long towards the far stick, Moss Papke brings the ball out for Wisbech. Good work from Clark on the left for Cambridge as Pamplin plays the pass out to her, driving with it to the byline, takes on and beating her marker gets into the area then looks to lift her cross up towards the near post, no one has gambled and the ball is brought out by Wisbech. Docrwa Hempting is back on for Wisbech. 15 minutes left to play and the game could go either way the action end to end Christian and Ingle work the ball up the right wing Ingle putting the ball into the area Stephenson intercepts and brings it out from the back sends the pass out to the left on for Rooks has Baird ahead of her rolling her in 20 yards out she slips as she goes to shoot the ball rolling tamely along the ground through to Mhunduru. GOAL! The stalemate is broken as the game moves into the final 10 minutes, Cambridge win a free kick on half way the ball is sent up towards the Wisbech area by Fay the initial delivery is dealt with by Wisbech but as they attempt to play it out the ball strikes Carroll rebounds back into Christian on the edge of the box, connecting with the ball sends it high into the night sky, is falling towards goal, back on her line Venni can’t keep it out as it drops under the cross bar and bounces over the line 2-1. Catherine Hanley comes on for Cambridge for Burt with 7 minutes left of normal time as they look to hold onto the lead. Get players back crowd Gutteridge off the ball as Luckett tries to send her through. Kowalewsky tries to do the same the ball played in over the top, Mhunduru is closer to it and claims before Gutteridge clatters into her. Cambridge break the ball swept out to the right by Fay into Carroll before the cross is put long out to Clark on the left opening her body for the shot shoots wide across goal from just inside the Wisbech box. Cambridge are looking to keep the ball when they can in the corner, Wisbech aren’t letting them settle, Moss Papke bringing the ball out onto Luckett, Hodgson ahead of her is given the ball is allowed time and space 20 yards out but gets the shot all wrong sending the ball high and out of play. Cambridge defend well in stoppage time and celebrate as the referee blows the final whistle to see them win 2-1 to retain the Junior Invitation Cup. 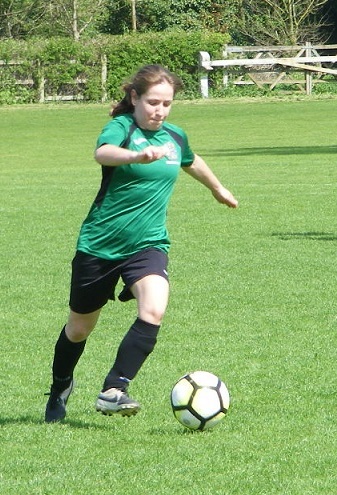 Not a classic and the result was never certain could have gone either way, Venni was named player of the match for the vital saves she made for Wisbech Town Ladies who did the Championship North proud giving Premiership leaders Cambridge a run for their money. 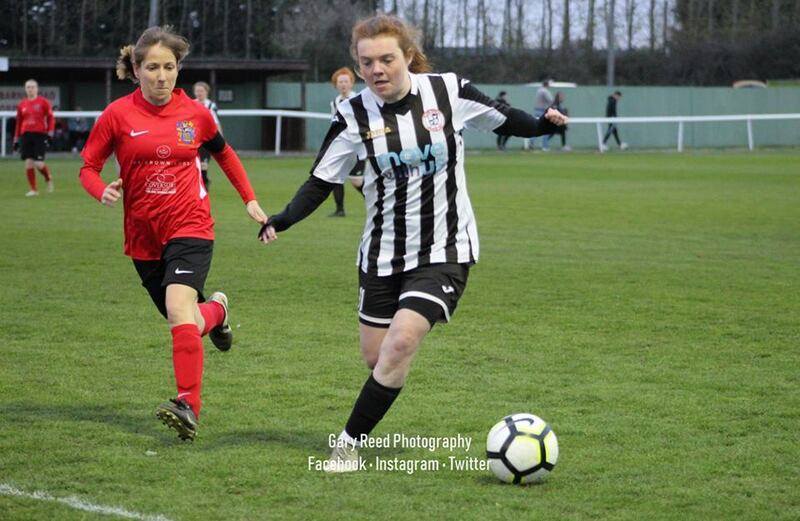 The club will be hoping to make it a double cup success with their 1st team contesting the Senior Invitation Cup tomorrow night again defending the trophy, while the Reserves get are in another Cup Final later in the month on the 28th April taking on Cambridge City Ladies in the League Cup, beaten finalists last year will be hoping to go one better this time around. Congratulations to Cambridge United WFC Reserves on their cup win. Best wishes to Wisbech Town Ladies injured player Kyra Clarke and thanks to Chris Abbott from the Cambridgeshire FA for his help with the squads tonight. 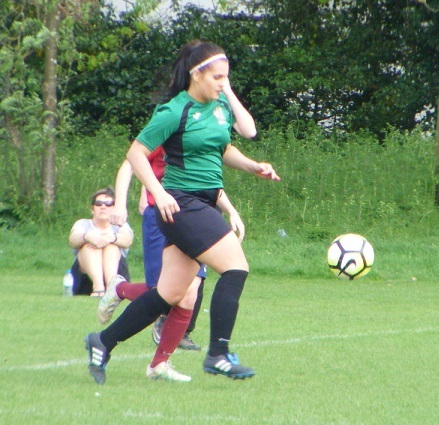 This entry was posted in Cambridgeshire Women's Junior Invitation Cup, Cup Final, Match Reports and tagged Cambridge United WFC Reserves, Cambridgeshire Women's Junior Invitation Cup, Cup Final, Match Report, Wisbech Town Ladies on April 14, 2016 by WFEast.